The City of Perth is the 4th Scottish city and 7th in the series of the #69Cities Portrait of the UK Project to be sketched by artist Carl Lavia, working in partnership with Lorna Le Bredonchel, and is currently on display at Perth Museum & Art Gallery. The giant Perth Sketch is a unique interpretation of Perth City Centre and the surrounding area, intricately detailing well known landmarks and buildings and providing a rare perspective of the city. 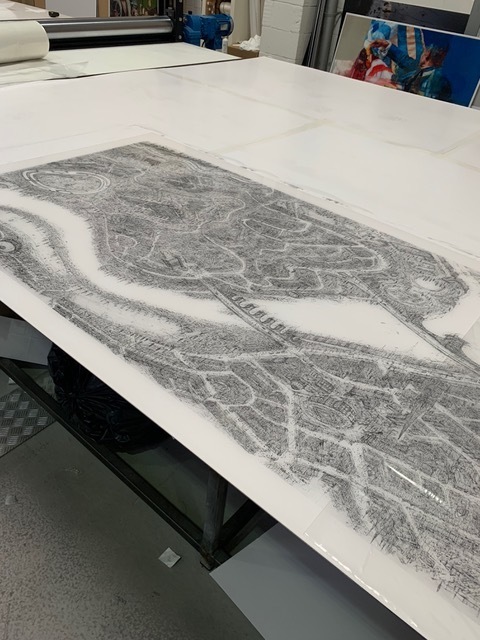 The giant 3m x 1m sketch looks like an aerial map from a distance, but close up you’ll see every hand drawn mark and line which creates the urban landscape. About #69Cities: In 2016, Carl teamed up with photographer Lorna Le Bredonchel and the #69Cities project was born. During their epic road trip, Carl is sketching in large scale every single city within the UK, alongside Lorna who is documenting the entire process. Each artwork takes between 2-4 months to create, during which time they explore the city by foot, Carl making sketches and Lorna undertaking research and taking photographs. 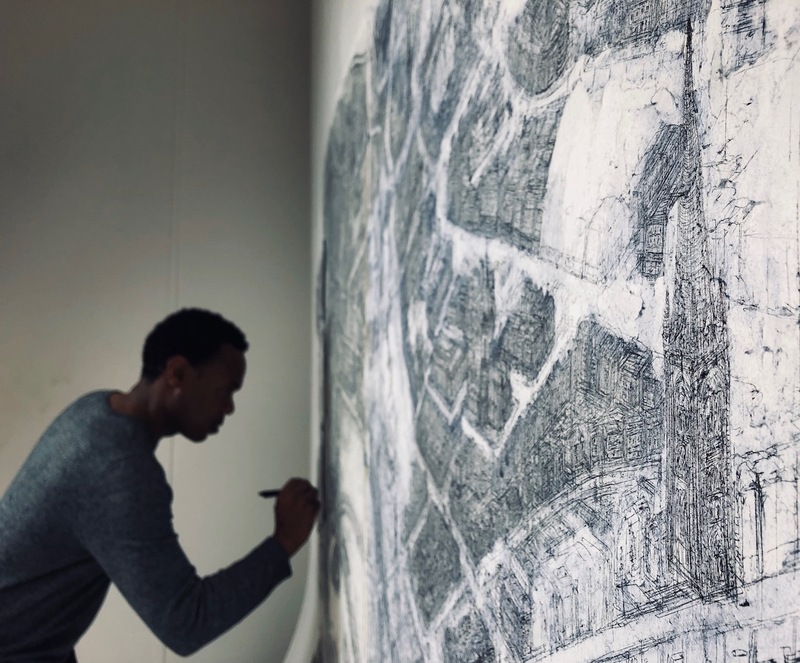 About Carl: Carl aka ‘Sketch’, is a self-taught artist and has been sketching since the age of 5, he loved creating fictional cities, hence his early interest in the aesthetics of architecture, maps, and cityscapes. Carl’s current practice focuses on depicting visited cities from an aerial viewpoint, emphasising the abstraction of pattern and intensifying the detail and abundance of information. About Lorna: Lorna studied photography at LCC, she handles the creative output across all aspects of the project including: beginning stages of each sketch, documenting the ongoing process, research, photography, video + still photography, online presence, and securing exhibition space within each city. Carl gathers copies of maps old and new, from 17C & 18C hand drawn maps to Google maps as well as scouring YouTube for local drone footage of the area, he then visits the city and spends time pounding pavements taking notes and photographs as he goes. Days off are spent revisiting the city he’s currently working on to freshen his memory as he works. Carl works with ink on archival paper and tends to favour only 3 sizes of technical biro as well as pencil, all of which need replacing every 3-4 days! 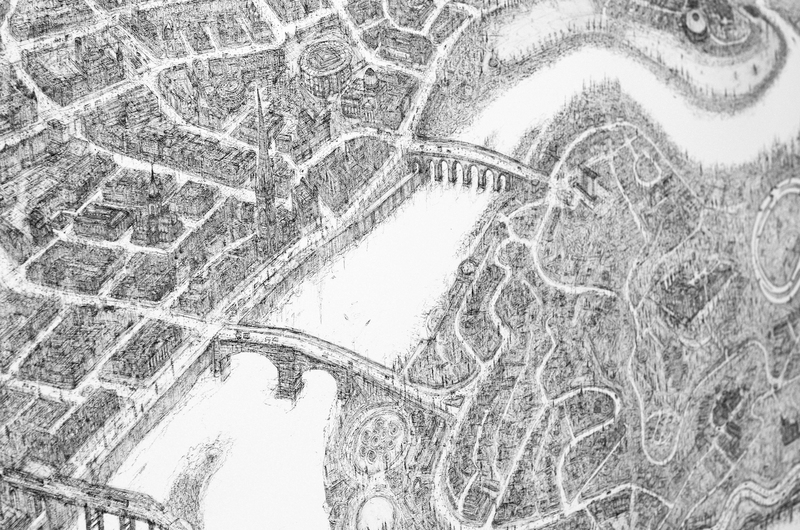 The first stage is to sketch the city in pencil, Lorna assists Carl by creating a basic pencil ‘scaffold’ then Carl layers over the minimal guide lines in pencil and ink, creating a more defined skeleton of the city. The work is then fleshed out over time by constant layering (and erasing) of lines to solidify the intricate city structures in black ink. Perth is the 7th city in the series (4th in Scotland) and as each one is completed, Carl is aware of how his process is developing along the way as he has chance to reflect on his process and finished piece. His current project is Inverness, with only Aberdeen & Glasgow left to complete all of Scotland’s cities, and plans are underway to create a touring exhibition of all the Scottish Cities once completed. What’s next? : The Perth Sketch has been purchased by collector Tony Banks who is delighted to loan it to Perth Museum and Art Gallery until October, when it moves to AK Bell Library until the end of the year, so it can be enjoyed by everyone, for free. Carl continues to work on the Inverness Sketch, and fittingly, Carl’s artwork, the Perth City Sketch features on the cover of a new book Perth & Kinross: A Pocket Miscellany, by Trish Colton, due for publication in February 2019 by Perth based Tippermuir Books. The aim of the ’69 cities of the UK’ project is to create a portrait of all UK cities by documenting the urban landscape in all its intricacy, variety and history, the project will culminate with Carl sketching London. You can follow their progress via social media, @sketchnthecity, @Lebredonchel, #69cities and visiting their website.